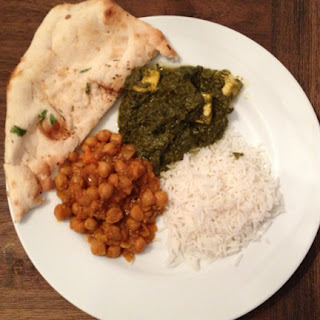 sometimes, one (me) just craves indian food. this happened last week. but instead of going our usual route, i wanted to try somewhere new. new (to me) = arya bhavan, located on w. devon avenue ... although, per the usual for a lazy weekday night, i ordered delivery. a bit about arya bhavan : "our food, with its unique combination of fragrantly subtle spices, is a representation of the many and varied regional cuisines of india & the many ethnic groups of people in the subcontinent." but the best part of arya bhavan, you ask? it's all vegan! i repeat -- it's all vegan. w/ many gluten-free & raw options. woo! palak paneer : fresh organic spinach & pan-seared vegan cheese, seasoned with cumin, onion, cinnamon, cardamom & garam masala spices. i have been craving palak paneer basically since the day i became vegan. no where offers a vegan version. so i absolutely had to try this. amazing. fantastic. must have. could eat for every meal, every day. chana masala : sun-dried chickpeas seasoned with cumin & fresh onion, sauteed & topped w/ tomato gravy. chana masala is the dish i judge all indian places by since it's almost always a vegan option. from arya bhavan? delicious. garlic naan : unbleached clay-oven baked fat-bread topped with cilantro & garlic. ah naan, another thing i've missed. the a.b. version was crazy good. arya bhavan also offers a buffet if you eat in the restaurant. i am definitely doing this soon. because i want to try pretty much everything on the menu ... & eat myself into an indian food coma. this food is so great ... aka you should probably head over there now. like.now.